Yes, ABC News reported to the world that James Holmes, the lunatic responsible for the "Batman" massacre, might be connected to the Tea Party. And what was the source of their explosive accusation? They went to a Tea Party website (a funny place to start a journalistic investigation) and found someone with the same name. That's all. One of 27 people living in the area with the same name. Subsequent investigation caused ABC to offer a small clarification when it turned out that the "Jim Holmes" they mentioned on the air had nothing to do with the shooting. But clearly, ABC News (and their "Chief Investigative Correspondent" Brian Ross) were trying to make the assertion that Tea Party rhetoric could be responsible for this violence - despite the fact that Tea Party rhetoric mostly boils down to "the government shouldn't spend more than it takes in." In a just world, Ross would lose his job and ABC News would be slapped with the biggest fine ever levied. And when I say "in a just world," I mean that will happen when Hell freezes over or when the MSM starts reporting news honestly. Guess which one I think will happen first? Okay, right off the bat we want to make something clear: Barack Obama has not imposed a tax penalty on farmers whose cornfields are withering and dying from an historic drought. And our question is: why not? After all, to help people who had no health insurance, the president passed a law which hits them with a tax penalty until they magically get insurance - so why not use this same logic to bring rain? And now that we think of it, America's dry, blighted, unproductive cornfields (which will soon be causing a spike in the price of food) are also an awfully good metaphor for America's private business sector in general. You know, the private sector that Obama says is "doing fine." Manufacturing declined again this month, consumer confidence is down, and joblessness "unexpectedly" shot higher last week. 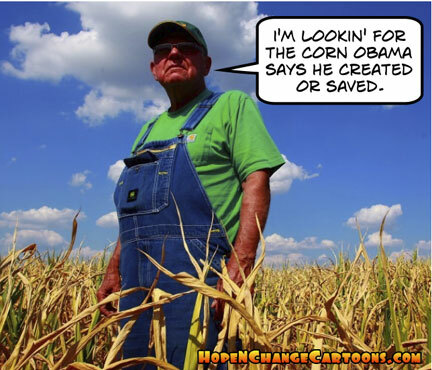 So what is Obama's plan (enthusiastically supported by his party) to finally make things grow again? Raise taxes on small business! Brilliant! Oh sure, there are those skeptics who say that raising taxes during recessionary times would really just "take more demand out of the economy and put businesses in a further hole," but what do those morons know? And...wait. What's that? Oh. It turns out that it was Barack Obama who uttered those words in 2009. But since that time, he's learned a LOT about helping things grow. Especially during times of an historic drought of honesty and leadership. Maybe it was stolen by the people whose jobs were created or saved. Barack Obama recently told America that nobody really builds anything on their own, and that someone helped along the way. And we think he makes a good point - because the amount of hopelessness, joblessness, and government dependence in this country has now been built to historic highs, and the "someone" who helped make all that happen is Barack Obama. As a case in point, for the past three months in a row more Americans are going on disability rolls than are finding jobs. 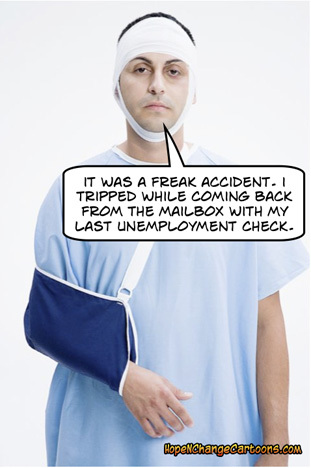 In the most recent month for which there is data, over a quarter million Americans were newly added to the disability rolls...although after the past 3 years, their injuries are very unlikely to be of the "on the job" variety. Or if not injured, perhaps these people have fallen ill due to the continuing effects of stress. Which we can definitely sympathize with - the economy is in the dumper, there are no jobs to be found (and over a million fewer jobs than when Obama took office), the Democrats are now threatening to raise taxes on every American, and our muttonhead of a president looks at all of this mess and declares "the private sector is doing fine." See? Your stress levels are going up already! 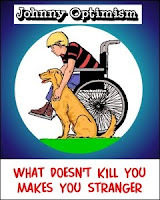 Of course, it's always possible that some of the many applicants for disability money are neither injured nor ill, but are simply successful frauds. Because, like the president said, even fraud can't be truly successful without the help of the government. The doctor says there's a lot of it going around. 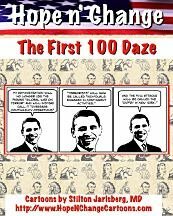 Broadening his attack on Mitt Romney, capitalism, success, prosperity, and America in general, Barack Obama spoke to supporters (who were clearly way more important than the NAACP) last Friday and made the stunning declaration: "If you've got a business - you didn't build that. Somebody else made that happen." Oh sure, you might have been the one with the original idea. You might have invested your own money. You might have done all the work yourself. But when you're finally presiding over an actual business...you didn't build it. And you damn sure shouldn't be allowed to keep the profits. To help illustrate this point for his supporters, the president then related the story of "The Greedy Little Capitalist Hen," in which a chicken plants a grain, waters the grain, tends the grain, harvests the grain, mills the grain, then makes it into bread with no help from the other lazy farm animals. 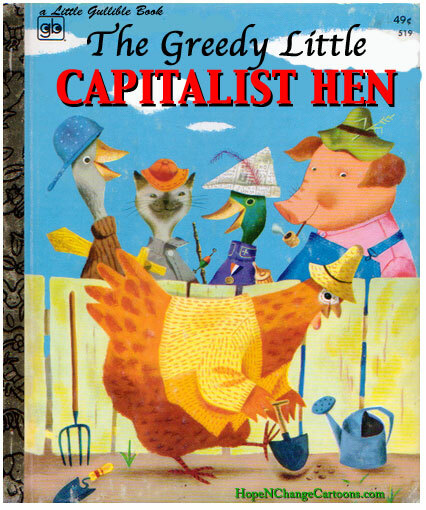 When they smell the delicious fresh-baked bread, they want to eat it - but the greedy capitalist hen says, "No. None of you did any of the work!" So the angry animals elect a leader who points out that the greedy capitalist hen didn't create the grain, or the soil, or the water by herself - and then says the lazy animals should not only get the bread, they should use it to make chicken sandwiches. And they all eat happily ever after! Well, they ate happily ever after until they ran out of chicken sandwiches and starved to death. But the president skipped that part of the story. Despite the fact that this is clearly a fairy tale, the president's supporters are eating it up just like the lazy farm animals they are. And it's even possible that Barack Obama himself believes that neither bread nor businesses can be created by the hard work of just one person. Though oddly enough, it's exactly the way he claims to have killed Osama bin Laden. BEFORE you kill her and eat her bread.